I have seen criticized because is supposed to be a strong response if there is no black stone at 5 or nearby. But after how should white respond? I suspect a, b, c or d but really have no idea. 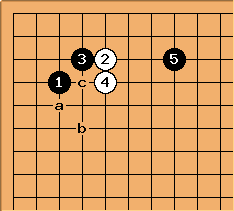 In particular I'm worried about black playing at b (or extending on the top). The first intuition should be a or b. a may provoke a fight at c. b presses the corner into a low position. After a black has shape problems in the corner. b seems too easy on black, although white's idea might be to go back and attack the pincer stone.